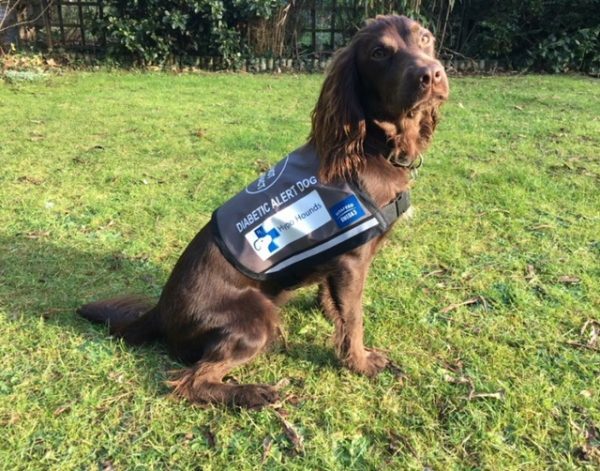 Just over a year ago we received a call from a man called Graham who was taking on a puppy working line Cocker Spaniel called Coco who was to be trained as a diabetic alert assistance dog for his teenage daughter. As part of the dog’s training she was required to pass the Gold level Kennel Club Good Citizen Scheme, which was where us at Homeward Hounds Dog Training came in. Graham was extremely keen get going and was being followed by a tv program that he had appeared on and they were doing an update on Coco’s progress a year later. I explained that it was quite a task with an age restriction on dogs taking part in the Gold exam but we would do our best to help him achieve this part of Coco’s training. Week after week Graham and his daughter Millie came to class, never missing a session, Coco was bright and had tones of drive and picked things up very quickly, she whizzed through the Bronze and Silver Awards and then training began towards the Gold. We realised that Coco’s motivator was without any doubt a ball which her owners utilised. Her ‘send to bed’ was inspired by the friendly banter in class with fellow Cocker Spaniel Gatsby, Graham’s competitive side came out when Gatsby managed to achieve the exercise first and he was determined to keep up with him. Coco wasn’t far behind and the following week the two dogs were level peg.The ’emergency stop’ and ‘out of sight stay’ were mastered in no time. So Graham asked if we could have an assessment before Christmas but with everyone being so busy and we felt Coco just needed a bit of fine tuning a date was set for early January. Test night soon came around and Coco sailed through it with flying colours. Coco had been doing her specialist scent training with a charity called Hypo Hounds who have done a fantastic job. The following day Coco attended another test to become an Accredited Diabetic Alert Dog where she passed every part of the test.